A number of high-profile websites will be taking part in an online protest tomorrow against the National Security Agency (NSA)’s surveillance of online activity and phone calls. The protest is organized by non-profit organization Fight for the Future, and will see participation from thousands of sites, including WordPress.org, Namecheap, Reddit, 4chan, Mozilla, Fark, TOR, Cheezburger, Demand Progress, MoveOn, and EFF, among others. However, none of the tech companies – like Facebook or Google – whose cooperation with the NSA was outed in the PRISM reveal will be involved in tomorrow’s events. The online protest is being described as a website and media takeover, where visitors will see the 4th Amendment plastered over sites in banners. There are also a number of blog posts planned, as well as proposed TV ads (see below). In WordPress’s case, the open source WordPress community will be involved, but WordPress.com users supported by Automattic will not be affected, unless they choose to participate themselves by blogging or posting banners of their own. 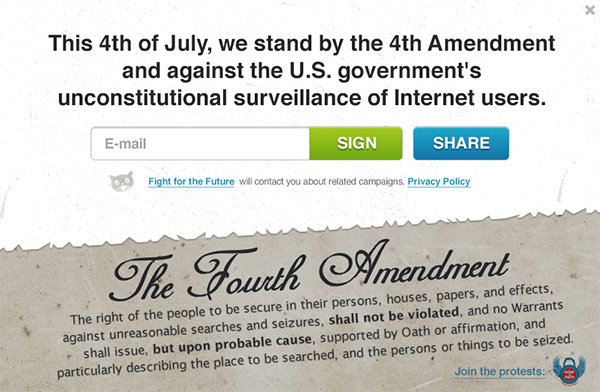 The online component to this project was built by Fight for the Future, which also runs related efforts at the Internet Defense League and the “take action now” site callforfreedom.org, which will serve as the main landing page for tomorrow’s campaign. The group has also helped build StopWatching.Us, a movement backed by a number of technical and political organizations, including also Mozilla, the Electronic Frontier Foundation, Reddit, and the ACLU. Fight for the Future likens tomorrow’s event to the previous anti-SOPA protests, which rallied Internet users against a misguided bill known as the “Stop Online Piracy Act” that had been criticized due to how it would harm existing web companies’ ability to do business in the name of fighting piracy. Those protests were more dramatic in nature, seeing complete blackouts of websites and other content on sites like Wikipedia, Reddit, Flickr and others before Congress dropped the bill. The StopWatching.Us campaign, which will benefit from the exposure raised by the online protests, has already gained over 539,769 signatures (as of the time of this writing) on its petition to U.S. Congress demanding that a special committee be formed to investigate the PRISM allegations. Its letter asks for “legal reforms to rein in spying and that public officials responsible for this unconstitutional surveillance be held accountable for their actions,” including specifically a reform of Section 215 of the Patriot Act (the section that allowed the NSA to get phone records from all the major U.S. phone companies) reform of the FISA Amendment, and changes to the state secrets privilege.